Helena Begum (above) had a problem. Her job at a garment factory in Bangladesh paid good wages. But her eyesight was fading. Approximately 12.7 million people in Bangladesh suffer from near vision loss, a consequence of the eye’s natural aging process. Without correction, it can significantly impact a person’s productivity, with serious financial, health and social implications. Uncorrected, vision costs the global economy an estimated $227 billion in lost income-earning potential. However, there is a seemingly simple fix. Of those experiencing vision losses, 2.5 billion individuals globally can have their vision restored with just a pair of eyeglasses ­­– and 77 percent of those individuals can be helped with a pair of reading glasses. The challenge is that many Bangladeshis still do not have access to health care that can help them diagnose their vision loss, nor do they understand that it can be treated simply with eyeglasses. Many people also lack confidence in their ability to use reading glasses, making them hesitant to make the investment. In addition, a gender divide means that while many men purchases eyeglasses after receiving a diagnosis, women often do not, either because they do not have the funds available or do not receive approval from their husbands to make the purchase. 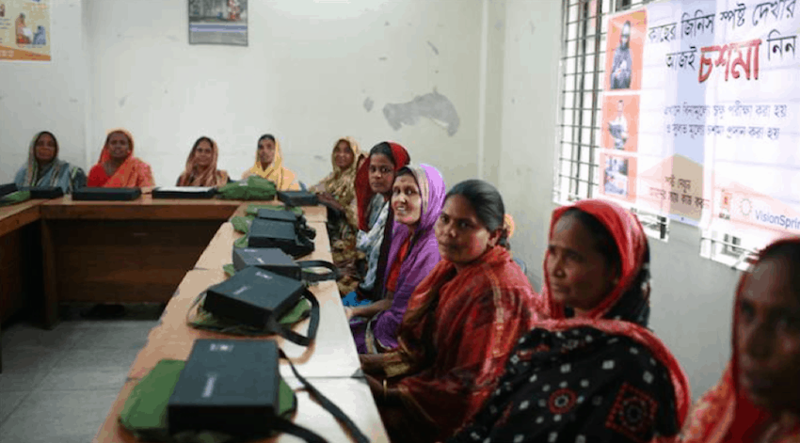 To address this large unmet need, BRAC and VisionSpring partnered to develop an eye-care delivery system with an innovative social entrepreneurship model: selling low-cost reading glasses to low-wage earners through BRAC’s network of community health workers in Bangladesh. How does it work? 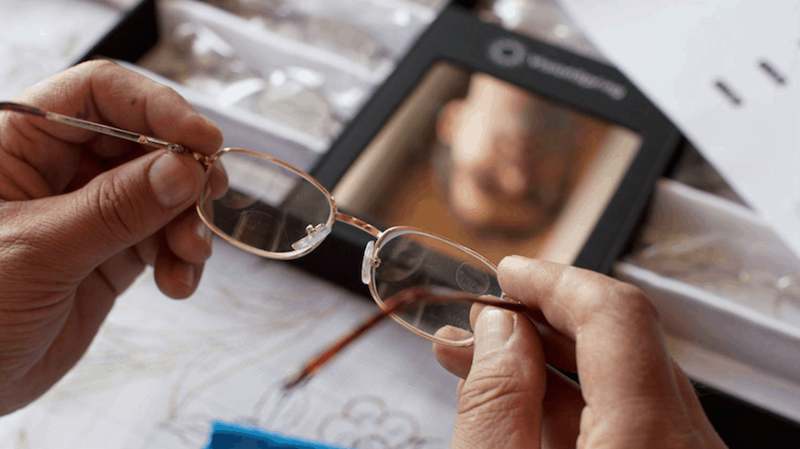 VisionSpring supplies BRAC with high-quality eyeglasses and provides assistance with program design, product development and demand forecasting. The eyeglasses are affordable for the average low-income customer and are manufactured in Bangladesh to keep costs down. BRAC’s health workers are trained to offer free eye screenings, referrals for specialized eye care and sell low-cost eyeglasses for a small profit. These services are accompanied with activities to educate the community, including informational posters, handouts and health forums. Revenue from the eyeglasses provides health workers a supplemental income and also covers some of the program’s expenses. Low-cost eyeglasses provided through VisionSpring and BRAC’s partnership. The vision initiative began in 2006 as a two-year pilot with nearly 560 community health workers in 27 sub-districts of Bangladesh. 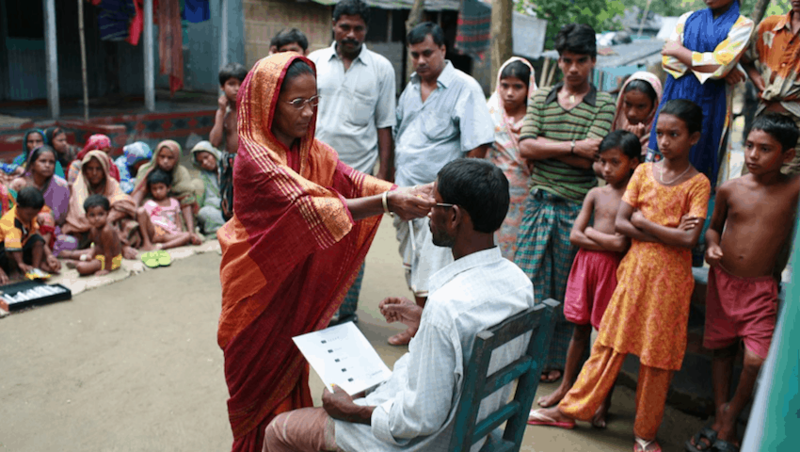 More than a decade later, the program now reaches 61 out of 64 districts in Bangladesh with 33,000 community health workers providing vision care. To date, BRAC’s health workers have screened 4.5 million people, sold more than 1 million pairs of eyeglasses and referred nearly 610,000 individuals for higher level care. According to VisionSpring, the program is estimated to have created the potential for $110 million in increased income at the household level, based on a study conducted by the University of Michigan. Additionally, BRAC’s health workers have earned a total of $450,000 in supplemental income and now hold unique skillsets that create opportunities for career advancement and improved workforce retention. Due to the program’s considerable successes in Bangladesh, BRAC and VisionSpring will begin piloting a similar initiative in Uganda in June 2017. At the conclusion of the initial pilot, BRAC’s Research and Evaluation Division conducted an independent review of the program to ensure its effective scale-up. The review revealed that the program provided sustained and increased productivity and earning power to the users of reading glasses. But the research team also identified many of the obstacles noted above: specifically that alongside access to eyeglasses, people with vision problems also need support from health workers and their community. It was determined that to effectively scale up the initiative, the education campaigns would need to be strengthened to provide in-depth knowledge on vision loss and its treatments. Past clients would be used as role models within campaigns to provide insights into their personal experiences, the worth of eyeglasses and normalize eyeglass wearing. The program would also take gender biases into consideration and would aim to provide an equitable expansion of the program. The skills of the community health workers would also be improved through hands-on intensive training with frequent refreshers and close supervision. BRAC community health workers engage in vision care training. BRAC’s health workers are at the center of not just creating access to affordable eyeglasses across Bangladesh, but to generating demand. 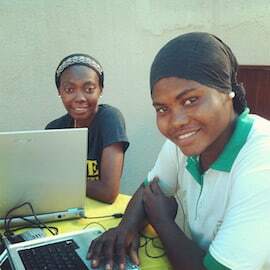 They have helped their communities to understand vision loss, the benefits of eyeglasses and how income can increase with improved vision; and also confront residual social stigma associated with wearing glasses. Over the course of 10 years, BRAC and VisionSpring have iterated the program design, adjusting to take into consideration social and economic constraints that inhibit the uptake of eyeglasses. Health workers are valued, respected and trusted members of their communities. They have a deep understanding of the contexts and constraints, permitting them to respectfully address and mitigate concerns. The program continues to expand its reach because of the dedication and effectiveness of the health workers. As a result, community health workers now screen more than 1.2 million people annually, with women making up 63 percent of the client base. For World Health Workers Week (which ends tomorrow), it’s important to acknowledge the integral role community health workers play not only in delivering basic services, but also the extraordinary impact they have as leaders and validators in their communities. This article first appeared on Locus and is reprinted here with permission. 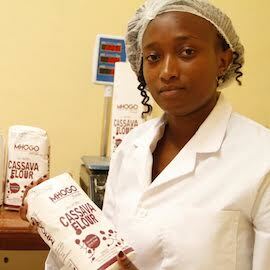 Sarah King is a Global Health Corps Fellow with BRAC USA.